Do you require a service for the removal of medical or clinical waste that meets the EPA requirements and is cost effective? Under desk - 39 litres. Samson HealthCare is Services is a specialist in bio medical waste disposal and a leader in the collection of medical waste. We provide a range of clinical waste bins and sharps disposal containers for the safe collection of Clinical Waste at the clients location. Clinical waste containers sizes range from 39 Litre medical waste bins through to a 240 Litre medical hazardous waste wheelie bin. 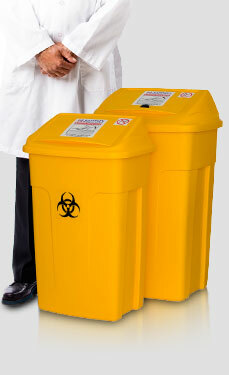 Samson HealthCare also offers disposable sharps waste containers. Samson HealthCare works with a host of clients that have various dental waste management and clinical waste collection needs, offering a flexible medical waste pickup service. We make disposing of medical waste easy. The frequency of medical waste collection can be daily, weekly, fortnightly, monthly or at a frequency and the medical waste bin to suit every client's requirements. Samson HealthCare has been particularly successful at tailoring medical waste removal from dentist and medical clinics generating smaller volumes of hazardous medical waste and where a more customized service is needed for the medical waste disposal and medical waste management, generally. Being a licensed Transporter of clinical waste for many years in NSW and the ACT, Samson HealthCare understands the concerns associated with infectious waste disposal and works to ensure safe and efficient, transportation and medical waste disposal. Licensed biomedical waste disposal facilities and licensed incineration facilities are used for the clinical waste disposal. These facilities are managed by regulated medical waste management companies with extensive experience with the disposal of clinical waste. Samson HealthCare as a licensed medical waste company has removed the bio medical waste in medical waste containers as required by the EPA medical waste disposal regulations and that disposal is at a licensed medical waste management facility. All medical waste removal companies must provide tracking for all medical disposals. Healthcare Waste that can be collected and transported by Samson HealthCare include four main waste streams, these are, Biohazard / Clinical and Related Waste, Sharps, Pharmaceuticals and Cytotoxic Waste. Biohazard / Clinical and Related Waste are waste which has the potential to cause injury, infection and offence. There are all types of medical waste. It includes all infectious waste disposal : - biomedical waste, sharps, laboratory waste, dental and veterinary waste, human tissue waste and other medical waste that has potential to cause disease. The transportation, treatment and medical waste disposal services of these specific waste streams must be in accordance with State, Territory and EPA requirements. Medical waste disposal companies are required by law to incinerate all pharmaceutical waste and all cytotoxic waste. Biomedical Waste management is our specialty. If you want to know how to dispose medical wastes just call on (02) 9756 1112 or for more information on medical waste treatment go to info@samsonhs.com.au.